How do I measure for a Martingale? How do I measure for a V-neck? Do you have colored leather? What comes included with my Paco Collar? 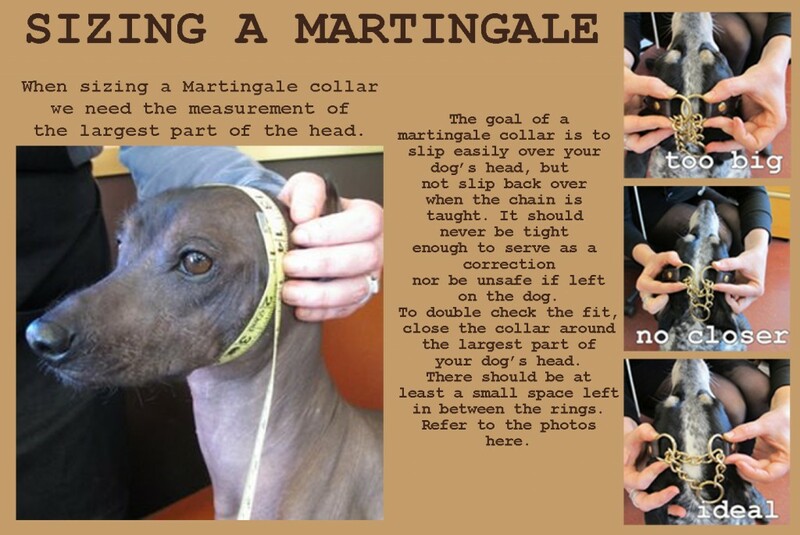 Our collars are based on actual neck size, not collar length. For instance, if you have a dog with a 17″ neck, you should order a 16-18″ collar. Better yet, give us your dog’s exact neck measurement in the notes section during checkout. We’ll make the collar fit perfectly! Simple. First, check out our handy guide that shows you the correct way to measure. 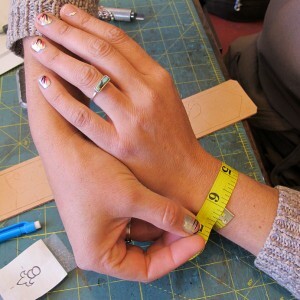 If you don’t have a cloth measuring tape, use a string and then measure it with a ruler. If your dog is still growing or you like a loose-fitting collar, no worries. There will be plenty of chances to communicate with us whether it be in the notes section during checkout or in subsequent emails. We can collaborate to make sure your dog gets the fit that you prefer. Also know that we are fairly lenient with exchanges for standard designs, so long as collars have not been worn or stamped with your dog’s name. More on that in the returns section. If you want to get the measurement from your dog’s current collar, lay it flat and measure from where the material folds at the buckle post to the hole you buckle with. See the photo below for an example. 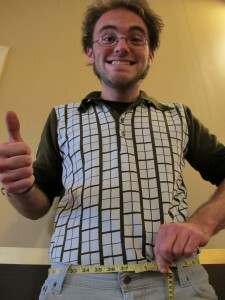 To measure your waist for a belt, simply thread a cloth measuring tape through the belt loops of your favorite pants. Don’t be alarmed if this size is a few inches larger than you expected! That’s normal… no need to rush out and begin the diet (yet). With wrists, babies, or anything else, remember that a flush measurement is best. When in doubt, give us the true size to work with and we’ll make it fit perfectly! The V-neck is intended for identification purposes only and should fit snugly over the dog’s head to rest at the base of the neck. 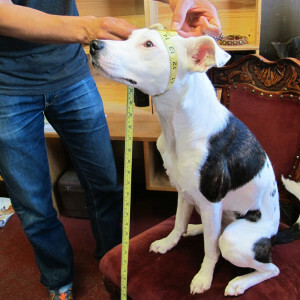 To measure, use a cloth measuring tape and go around the largest part of the dog’s head. Bribe with treats as necessary. Leslie’s pup Gnome says that peanut butter on a spoon works well! We will take that number and create a piece that will fit over your dog’s head but not come off easily once it’s on. Why not? Nah, just kidding. There’s actually a very good reason why our products are leather. Basically, leather is the most natural material for your dog to wear. Not only is leather the similar to your dog’s natural chemistry, but over time the oils from their skin will condition the leather to a buttery texture. Well-treated leather will not irritate the skin nor break the hair shaft. On an environmental note, leather is biodegradable. It is also sturdy enough to last for years — perhaps generations — so it is the quintessential non-disposable product and actually becomes cost-effective in the long run. Aftercare is simple. In fact, if you never do anything to your product it will still stand the test of time. Go ahead, get it wet (Paco swam in his collar all the time) and get it dirty. If you need to, wipe the leather off with a wet rag. If your dog rolls in something truly disgusting, use dish soap. If you think the leather is getting a little dry, use any leather conditioner to bring it back to its original state — but we’ll doubt you’ll have to do that. We make things with functionality first, fashion second. We work exclusively with the best latigo leather on the market. Unfortunately, it only comes in a few shades (black, brown, burgundy, and tan). It’s the same grade of leather used for fine horse tack. Colored leather is usually poor quality. As they say, a rotting house with a new paint job will still fall down. Quality means everything to us, so we sacrifice color options to ensure that your collar will stand the test of time. We’re pretty adamant that you get the collar that is perfect for your dog, so we’re pretty open about exchanges. However, please let us know immediately, since we cannot exchange used collars. 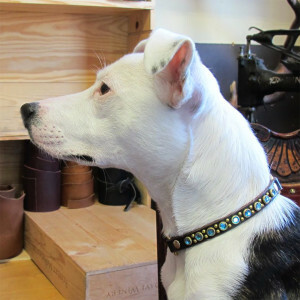 We can do an exchange or refund only for unworn, in new condition collars (no scratches, bite marks or signs of wear). If you let your dog wear the collar for a bit before deciding the fit is wrong, let us know and we can come up with a creative solution. We will issue a refund or exchange upon the return of the collar. All we ask — nay, beg! — is that you double-check the size you’re ordering and make sure the width will suit your dog. If you have any questions at all regarding what will look best on your pet, contact us and include an image of your dog. We’re pretty good at figuring out what styles complement different dogs (we’re breed nerds). Heck, it’s what we do for a living! We accept credit cards, debit cards, PayPal, and cold hard cash. Orders usually take 2-3 weeks from the point we receive your order and verify payment to the time it hits your eager little hands. In certain instances, we can meet quicker deadlines, and we do offer rush shipping, but the handmade nature of our products necessitates a certain amount of production time. If you’re one of those people who has to have it now you can always pop by the shop or give us a call with your dog’s neck size and some preferred styles. We’ll see what we can do! Your Paco Collar comes with a lifetime of free repair! We hope that you’ll never need it, but should something break, we’ll repair or replace your product. That said, we do have limitations. If your dog chews up the collar, we can fix it, but pricing will be based upon the damage. But if a rhinestone falls off, by all means, get in touch! We’re also happy to swap out colors for a nominal fee. Also note that tan leather varies greatly from hide to hide, and may turn quite dark over time. You can prevent this by removing it before your dog goes swimming or plays in the mud, and then it should retain its lighter color for years to come. When your pet passes away, we will turn your product into a memorial bracelet for free. Just send us the collar and your wrist size, and we’ll make you a wearable memento. Key fobs are also a possibility. We receive a huge number of requests every month, and while we would love to donate to every cause, we just can’t. We are currently only donating in kind to publicly funded animal shelters that have an active photography program to promote adoptable animals. We feel that we can do the most good by making these shelter dogs stand out and get adopted faster!